Wikipedia | During the riot I remember staying indoors for many days with extra people living in my house because they couldn’t go home due to riot, it was a period of uncertainty. 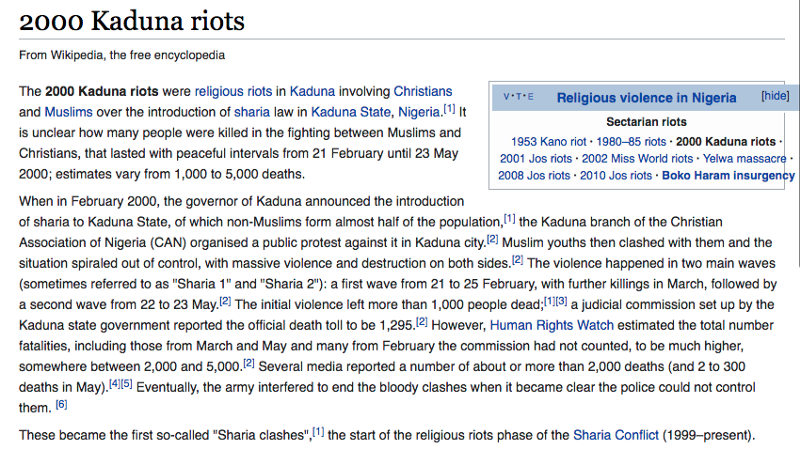 Thank God we lived in the Christian part of Kaduna so we were not directly exposed to the riot, I also can’t remember losing anyone I knew. I grew up in the Northern part of Nigeria, Kaduna state in the 90s, It was pretty normal for Christians and Muslims living together, I never considered why we were Christians and the other people were Muslims, I had also later been taught in school that there were three major religions in Nigeria: Christianity, Islam, Traditional worshippers. I never considered why other people served other gods, it wasn’t a priority then. Sometime after the Kaduna riot, my family left Kaduna and came to Lagos, partly because the change of employment and the search for a better life I guess. Looking back I don’t think the riot had any effect on me because I was young and innocent, I knew what was happening but I soon forgot, However, I think it was period that highlighted the differences in religious beliefs — Islam and Christianity, for other religions I got a feel of the difference through movies. Autopilot: A state of mind where one no longer thinks about doing one’s actions, but acts mechanically. I grew up in a Christian home raised by Christian parents so it was normal to be taught the ways of the Lord.It was just normal to do Christian things, read the bible, pray, go to church, do good… I didn’t understand why we had to spend prolonged periods of time praying when I had finished praying for the whole world within a short period of time. I didn’t I had any spectacular new birth experience or such. I became born again because it was the ‘right’ thing to do, not spectacular experience or encounter. After encountering different worldviews. I was still on autopilot mode but I started questioning why I do the things I do, why I believe the things I believe. He saw that intellect alone could not resolve the question of authority. You must go beyond intellect. He thought of the faith used constantly in daily life: he did not know how a train or plane or car worked, but he rode them…. Was it only in things of the spirit that such faith was wrong? I believe this is the stage where I am at now, I’m getting to understand that there’s a logical explanation and clearer meaning for many things in the Christian Faith. While I might not understand everything I believe in yet, its comforting exploring this stage. Christianity is all that mystical. I agree with Mahatma Gandhi that Christians many at times do not behave as they ought to but man’s flaws do not discredit the authenticity of Christianity. I’m on the search for greater understanding, I’m paying more attention to Christian apologetics now. Reading The Islam Debate — Josh Mcdowell & John Gilchrist and Seeking Allah, Finding Jesus: A Devout Muslim Encounters Christianity‎ — Nabeel Qureshi have been quite eye-opening. And then if they say, “Ah, but how do you know that that person is not being created by somebody else?” Then I would say, “Then the person creating him is just as phenomenal, and they win my trust. And if they win my trust then they’re not lying to me.” The Apostle Paul is not a lunatic. I cannot read the 13 letters of Paul and think he’s crazy or a liar. 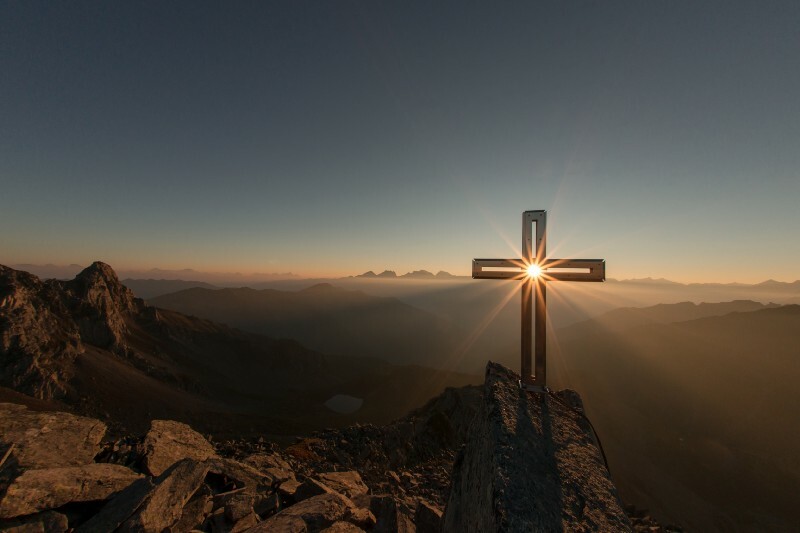 I am a Christian because I am convinced that Jesus Christ is the only way to God based on experience and research that proves the authenticity of the claims of the Bible and the Christian faith. Here are few reference materials that have helped me find clarity.